The nutrition and diet will play an important role in our usual life to keep us healthy every day and helps to participate in physical activities with great stamina. Pregnancy is a precious process in every woman life. During this period, one should focus on a balanced diet and healthy lifestyles. A healthier mother can deliver a healthy baby by following guidelines on diet, exercise and rest during pre-pregnancy and post-pregnancy. The nutritional/dietary requirement will be enhanced during pregnancy and mothers shall eat food that gives strength. To avoid pregnancy-related risks, do stay away from processed food, alcohol, smoking which are harmful to the fetus. 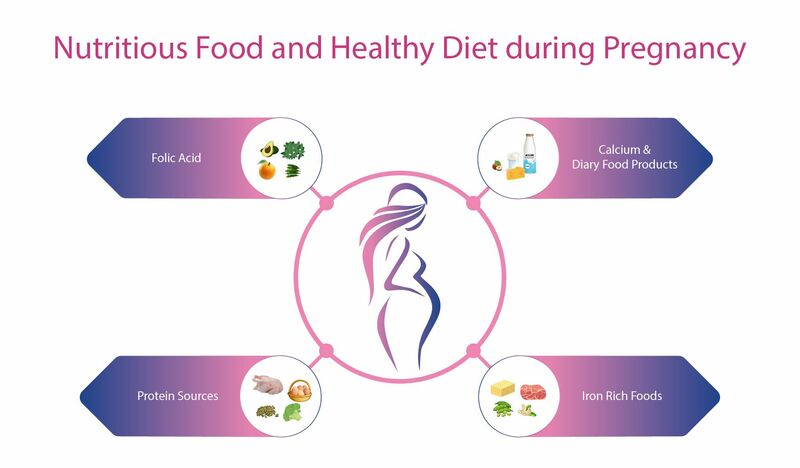 While coming to diet or food of a pregnant woman, it should contain high Protein, High Calcium and other essential micronutrients like vitamins, Iron and folic acid. Proteins help to develop human cells in the body. Especially for pregnant women, a minimum amount of 70 to 100 grams per day of protein is suggested by the Dieticians. Dals (Lentil, Green Gram, Black Gram, Red Gram, Bengal Gram), Sprouts, Groundnuts, Cashew nuts, Almonds, Broccoli. White or Brown Soya Bean. Cheese, Khoa, Skimmed Milk, Whole Cow Milk Powder, Panner. Iron-rich foods help to maintain the haemoglobin level in a pregnant woman in-turn achieves better oxygenation for the fetus. Lean Meat and Spleen (Goat, Sheep). Tofu, Beans, Spinach, and Potatoes. Red or Green Amaranth Leaves. Calcium helps to strengthen the bone, teeth and also helps in the development of a healthier heart. Folate is also known as Folic Acid or Vitamin B9. These will prevent neural tube defects and birth defects of the brain and spinal cord. Hence, it is highly recommended to take supplementary folic acid for a pregnant woman. Safe exercises or prenatal classes at home are advisable for pregnant women. Spending at least an hour daily for physical exercises like Lamaze, pregnancy safe exercises, yoga, walking under the supervision of the therapist helps overcome stress and to adapt the bodily changes during pregnancy. Adequate sleep is an important aspect and undoubtedly essential for a pregnant woman carrying another life in her womb. Studies suggest that sound sleep for 8 to 10 hours a day is required. It is not an easy task for women to take care of themselves while they are carrying the baby. Surely an extra person is needed to look after them during and after their pregnancy period. Hire professional caretakers or choose Pre and Postnatal Care Service Providers, to help her in the motherhood journey.